I like the way these three play with your notion of perspective. From the back of the first girl looking forward into the snowy streets, to the second one looking down almost hopelessly with pictures of moments hanging above her, to the third one looking back over her shoulder at who knows what she's left behind back in "normal." They're all three lovely in both title and cover and I am eager to get my hands on them. I'll just go ahead and say that this is my favorite of the three covers. I just looks like a street I used to live on and that, combined with the light blue glow of the umbrella, and the wonderful title and I want it on my shelf. The insides sound quite complicated and not a bit daunting. Alex's parents get divorced after her father's infidelity tears their marriage apart. Moving to a new town with her mother, Alex finds attention in spades from bizarre twins Fred and Adina. Due out October 5th. Fathers are not doing well for us this fall. After her photographer father commits suicide, Eddie devotes her every waking moment to putting together the pieces of the puzzle leading up to her father's unexpected death. In the course of her searching, she encounters one of her father's students who seems to know more than he ought to. I'm a huge fan of Summers' after loving Some Girls Are. Very much looking forward to her third novel. Due out December 21st. I had to laugh reading a description of this one as it mentions protagonist Janie Gorman is forced to put up with a mother who is something of a celebrity blogger among the granola mom set. What a fun idea. Needless to say, she's longing for something a little more normal. I think I'll like Janie. She takes up the bass and joins a band and associates with the likes of a boy named Monster. Bring it on. Due out March 22nd. I love Lauren Strasnick's cover! I'm also looking forward to reading the book. I'm a big fan of her first novel, Nothing Like You. It reminded me a lot of Liz Gallagher's The Opposite of Invisible, which I also loved. These are gorgeous. I love the way the first one, "Her and Me and You," feels so full of things to be revealed. I love that in a book. Though, I'm also quite attracted to the others. "Fall for Anything" feels really inviting. Interesting that they've chosen such similar fonts, too! 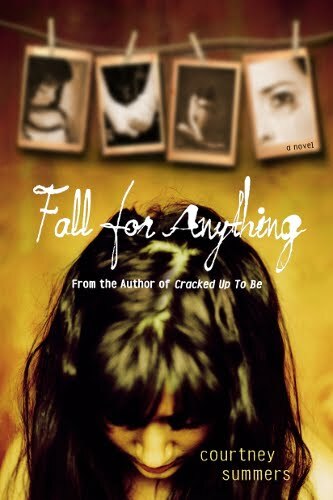 Oh my gosh I feel so behind I didn't even know Fall for Anything had a cover I love Courtney Summers! All the covers are so interesting they make you think. 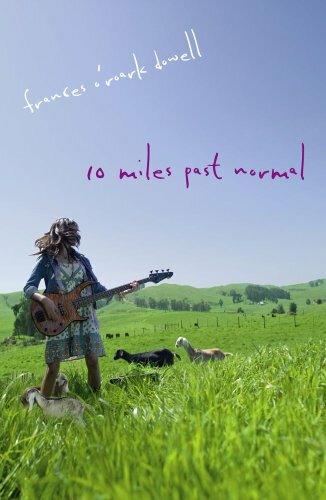 I definitely want to read 10 Miles. Her and Me and You too, probably, since I like stories about twins. I like them all! But I think I like the second one the most. Or maybe the first... I don't know! Loving that cover for Her, Me and You. The story sounds pretty awesome as well! Ladybug, 10 MILES PAST NORMAL does sound fun, doesn't it? Karen, I haven't read her first book and am wondering why. You think I'd like it? Carolyn, nice job pointing out the font similarities. I hadn't noticed that! Shallee, my pleasure. I'm intrigued by each of them. Caitlin, I'm so glad it comes out this year. I've been looking forward to it ever since finishing SOME GIRLS ARE. Livi, interesting. Which twin books do you recommend? I don't know that I've read that many. La Coccinelle, lol. Hard, isn't it? Darren, it does. Not your run-of-the-mill sounding premise, is it? Ari, agreed. It just comes together as a very inviting whole. These are all beautiful covers. Many times the cover of a book makes me want to read it even more. They all sounds like great reads! 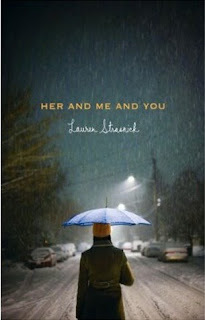 I love the cover for Her and Me and You! The premise looks interesting as well. I will be on the lookout for reviews of this. 10 Miles Past Normal sounds super good. Awesome line up. I want to read all three! Yup, these all sound fantastic. I definitely want to get my hands on 10 Miles Past Normal. Thanks for bringing them to our attention! I think so, Angie. But if you read it, I would suggest reading The Opposite of Invisible by Liz Gallagher as well. The styles are so similar, but Opposite was published a year earlier. Both are very short novels. Chachic, it really does. Sounds truly different. In a good way. Alison, yeah, that premise made me grin. Katie, that one seems to be garnering a lot of positive attention. I'm glad. Tina, that's true. They do look that way. Guess I'll pick which one to read first depending on my mood at the time. Karen, okay. Good to know.